I feel that it’s safe to say that we get way too caught up in the excitement of next generation technology. We tend to see that it is the new model and immediately go crazy for it. Normally this isn’t that big of a deal, but what happens when you have new tech that performs a lot like the last generation model you have at your house? This type of issue doesn’t normally arise for big name tech companies, as they are usually on top of their game. As fate would have it however, our friends over at Apple may need to check on their new Macbook Air. Sources are saying that it may not be as fast as its preceding model.There are reasons for slight variations in the performance power of your particular Mac. Reasons being, due to the fact that Apple tends to go to different suppliers for their SSDs, or solid-state drives. Naturally, since each manufacturer will create a different drive, the performance of a Mac could vary based off of which brand drive was placed inside the Mac. To be a bit more specific in terms of performance speed, I’m talking about the read and write speeds of the Macbook. The current 2014 model, utilizing a 128 GB SanDisk SSD, is clocking in at 705 MBps and 315MBps for the read and write times, respectively. Comparatively, the last gen 2013 Macbook Air using a 128 GB SanDisk SSD came up with almost identical read and write times of 711MBps and 316MBps respectively. Now mind you, these are only the speeds of the Macbook Air models using a specific gigabyte capacity and a specific brand, so times could easily change depending on the variables of the driver and its capacity. Apple has been supposedly doing this for years now, and some buyers are aware of the SSD manufacturer differences. They’ve gone through competitor companies that some may not expect however. They’ve bought drives from companies like Toshiba, and their biggest competition arguably, Samsung. Here is the big kicker for purchasing a new Macbook Air; you won’t be able to tell what SSD you have until you purchase it, boot it up, and look at your specs through the laptop itself. There is also no way to tell which laptop will be receiving what brand of solid-state driver. You pick your laptop, buy it, and whatever you get is whatever you get, unfortunately. It’s generally hard to comparatively test out the speed between different models because of the random SSDs that will be inside the machine. Macworld did a test of a few different Macbook Airs from 2013 and 2014, but was unable to come up with any solid finding because of the difference in the drives and capacities of the drives that came with each laptop. Contact www.RentOurLaptops For Your Next MacBook Air Rental Or Call 888-736-8301 Today! Needless to say, it feels as if Apple is either not caring about what type of drive goes into their machines, or that they are basically rehashing old tech and selling it with a fresh name and fresh coat of paint. 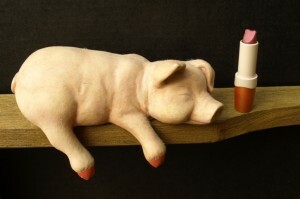 If you put lipstick on a pig, it’s still a pig (see picture). Hopefully this isn’t the case with the new Macbook Air. Hopefully that are some differences between the new model and old model that will justify the new model’s $899 price tag.